The Washington Post was greatly impressed by its review of the Ram ProMaster City, recognizing the potential Ram’s work van could bring to urban work areas such as downtown Atlanta. Atlanta Commercial Trucks powered by Landmark Dodge Chrysler Jeep Ram of Atlanta has a large commercial force dedicated to the tradespeople and business owners of the Southeast. The all-new 2015 ProMaster City is powered by a 2.4-liter I4 TigerShark Multiair engine. Atlanta contractors can drive the van all over the city as it provides 21 mpg city/29 mpg highway. The fuel economy combines well with the work van’s cargo storage to make one impressive tool for Atlanta-area businesses. “The 178-horepower engine with 174 pound-feet of torque delivers,” Washington Post columnist Warren Brown wrote. Brown went on to detail the ProMaster City’s stable handling. He credits Ram and its aerodynamic exterior design along with electronic stability control and the use of a bi-link rear coil suspension. In regards to compact cargo vans, the Ram ProMaster city outperforms its class when it comes to capacity. Payload capacity? The 2015 ProMaster City has Atlanta businesses covered at 1,883 pounds. The Ram ProMaster City also delivers with a towing capacity of 2,000 pounds. Its size means Atlanta electrical workers can park in even the most compact urban spots or in any suburban subdivision. 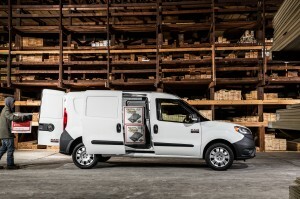 “[The Ram ProMaster City] is right on target for what urban and suburban tradespeople say they want,” Brown said. 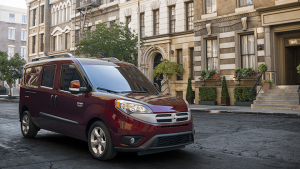 The 2015 Ram ProMaster City can fill the needs of the Atlanta business owner. As a fleet vehicle, it is available in a passenger-style van with five seats. For Atlanta’s general laborers, it can be purchased in a Tradesman trim for cargo and equipment hauling. Learn more about what the ProMaster City can do for your Atlanta business. At Atlanta Commercial Trucks powered by Landmark Dodge Chrysler Jeep Ram of Atlanta, we help drive your business with work-ready Ram pickups, Ram chassis cabs, vans and more. Landmark is the only Atlanta area Chrysler Dodge Jeep Ram dealer with a sales division dedicated to our business customers. We are the fastest growing Ram commercial dealer in Georgia and the Southeast! We have one of the largest Ram work truck inventories in the state and carry 2500 and 3500 utility trucks as well as 4500 and 5500 chassis cabs. Call us today at 678-251-2283 or come by today at 6850 Mount Zion Blvd. in Morrow, Ga.